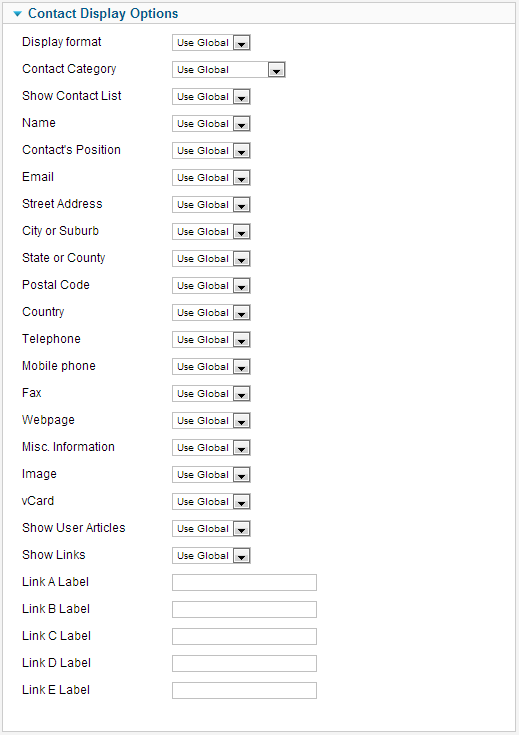 Click the Menu Item Type Select button and then click the Featured Contacts link under Contacts. To edit an existing Featured Contacts Menu Item, click its Title in Menu Manager: Menu Items. Used to show all Contacts that have been tagged as Featured. Contacts are shown in a Category Layout. List Layout Options control the appearance of the list layout. Position. Show or Hide the position of the contacts in the table. Email. (Use Global/Hide/Show) Show or Hide the email of the contact. Phone. Show the phone number of the contacts in the table. Mobile. Show the mobile number of the contacts in the table. Fax. (Use Global/Hide/Show) Show or Hide the fax number of the contact. City or Suburb. (Use Global/Hide/Show) Show or Hide the city or suburb of the contact. State or County. (Use Global/Hide/Show) Show or Hide the State or County of the contact. Country. (Use Global/Hide/Show) Show or Hide the Country of the contact. 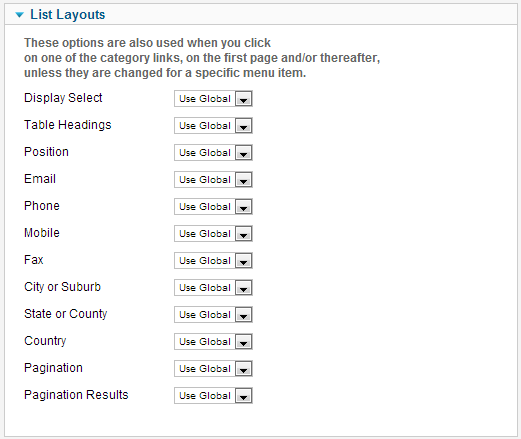 The Category List Layout has the following Contact Options, as shown below. These options determine how the contacts will show in the list layout. Use Global: Use the default value from Contact Manager Options. The Contact Options are as follows. Display format. 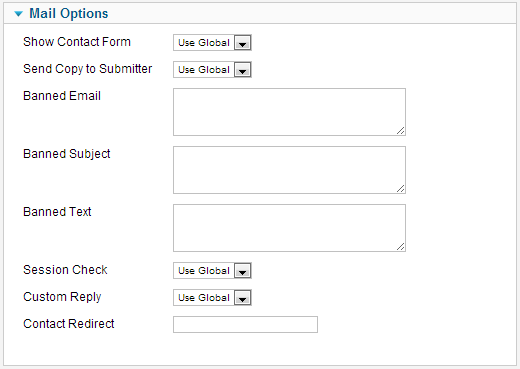 (Use Global/Sliders/Tabs/Plain) Determines the style used to display sections of the contact form. Contact Category. (Use Global/Hide/Show Without Link/Show With Link) Shows or Hides the contacts category with or without a link. Show Contact List. (Use Global/Hide/Show) Show or Hide a drop down allowing the selection of any other contact from the same category. Name. (Use Global/Hide/Show) Show or Hide the name of the contact. Position. (Use Global/Hide/Show) Show or Hide the position of the contact. Street Address. (Use Global/Hide/Show) Show or Hide the street address of the contact. Postal Code. (Use Global/Hide/Show) Show or Hide the Postal/ZIP code of the contact. Telephone. (Use Global/Hide/Show) Show or Hide the telephone number of the contact. Mobile Phone. (Use Global/Hide/Show) Show or Hide the mobile number of the contact. Webpage. (Use Global/Hide/Show) Show or Hide the Webpage of the contact. Miscellaneous Information. (Use Global/Hide/Show) Show or Hide the Miscellaneous Information of the contact (note this is called Contact Information in the Contact Component). Image. (Use Global/Hide/Show) Show or Hide an image to be displayed with this item/category in the front-end. vCard. (Use Global/Hide/Show) Show or Hide the vCard (electronic business card) link for this Contact. Note that the "Enable vCard" option in the Contact Manager - Options must be set to "Show" for this option to work correctly. Show User Articles. (Use Global/Hide/Show) If the contact selected has a Joomla profile linked - then all the articles that user has posted will be displayed. Show Links. (Use Global/Hide/Show) Show extra links for the contact (see the parameters below). Link A Label. (Input Field) Label for an additional link for this contact. Show Contact Form. (Use Global/Hide/Show) Show or Hide contact form. Send Copy to Submitter. (Use Global/Hide/Show) Show or Hide checkbox to allow copy of email to be sent to submitter. Banned Email. Email addresses not allowed to submit information with the contact form. Banned Subject. Subjects not allowed in contact form. Banned Text. Text not allowed in contact form body. Session Check. (Use Global/No/Yes) Check for the existence of session cookie. This means that users without cookies enabled will not be able to send emails. Custom Reply. (Use Global/No/Yes) Turns off the automated reply, allowing for Plugins to handle integration with other systems. Contact Redirect. Enter an alternative email address, where information will be sent to. This page was last modified on 20 February 2013, at 14:00.